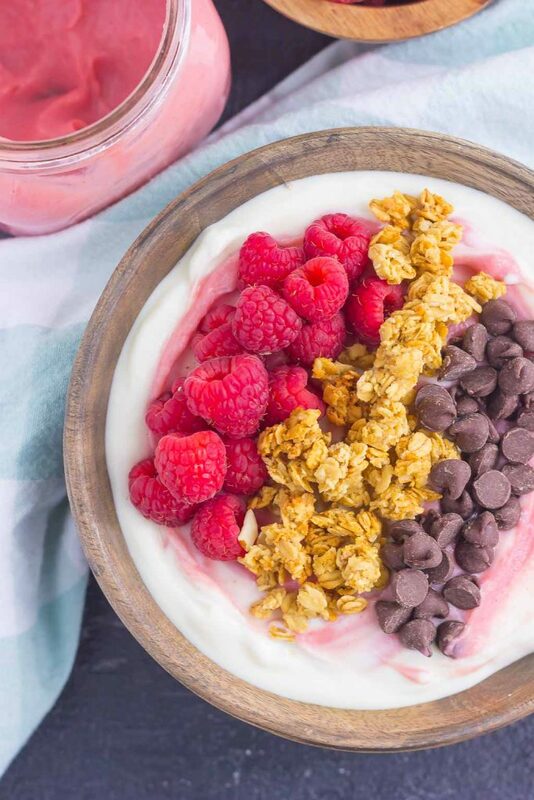 This Raspberry Grapefruit Yogurt Bowl is a delicious way to start the day. It’s packed with creamy vanilla Greek yogurt, a swirl of raspberry grapefruit curd, and topped with a combination of sweet ingredients. Fresh, flavorful, and light, this is the best way to switch up your breakfast or snack routine! Remember that Raspberry Grapefruit Curd that I shared with you last week? Well, it turns out that I couldn’t keep my spoon out of the jar, so instead of inhaling it ALL in one sitting, I did the next best thing: I made a Raspberry Grapefruit Yogurt Bowl! This way, I didn’t feel quite as guilty if I ate all the curd, and then some. After all, it’s now combined with yogurt and other nutritious ingredients! But really, have you tried yogurt bowls before? I shared this Grilled Peach Caramel Yogurt Bowl last summer, and I’ve been hooked ever since. They’re essentially the same as a smoothie bowl, but with yogurt as the base. It’s easy to make (no blender needed!) and sooo good for a quick breakfast. 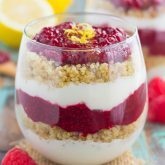 If you eat yogurt often in the mornings like I do, then you’ll love this Raspberry Grapefruit Yogurt Bowl. It jazzes up your regular yogurt routine with a fruity swirl from the curd, and all the fun toppings! After all, the toppings may just be the funnest (is that a word?!) part. I loaded this bowl with fresh raspberries, crunchy honey granola and a few (or a lot) of chocolate chips. It balances out the combination of sweet flavors and makes this bowl oh-so good! And the best part? 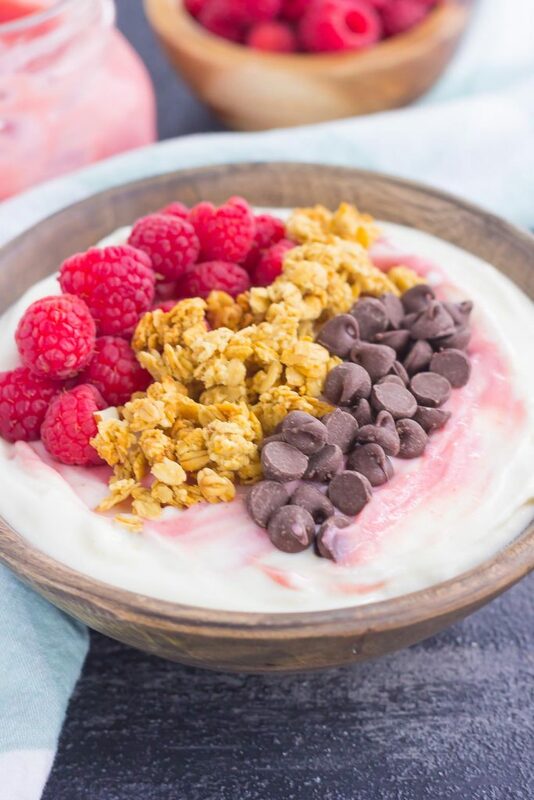 This yogurt bowl is so easy to customize depending on your tastes! 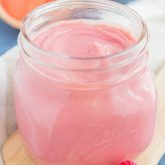 Feel free to use a different flavor of yogurt, swirl in some raspberry jam, or add in some chia seeds or other fresh fruit. The possibilities are endless! But whatever you do, you need to make this Raspberry Grapefruit Yogurt bowl. 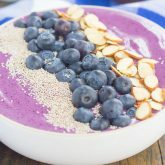 It makes the most delicious breakfast or snack and will keep you fueled all day long! Looking for more easy breakfast recipes? I’ve got you covered! This Raspberry Grapefruit Yogurt Bowl is a delicious way to start the day. It's packed with creamy vanilla Greek yogurt, a swirl of raspberry grapefruit curd, and topped with a combination of sweet ingredients. Fresh, flavorful, and light, this is the best way to switch up your breakfast or snack routine! Pour yogurt into a small bowl. Add Raspberry Grapefruit Curd and gently swirl to combine. Top yogurt with raspberries, granola, chocolate chips and chia seeds, if desired. Thanks for the yogurt love and pin, Dawn! I'm not surprised at all that it was difficult to NOT eat all that gorgeous grapefruit curd with a spoon! But I LOVE that you practiced ALL the self restraint and saved some for this bowl! This is SO pretty, Gayle! And I looooove the flavors in here! Plus, anything customizable is a total win in my book! Such a yummy way to start the day! Pinned! Cheers, friend! What a pretty breakfast, Gayle! I bet that grapefruit curd adds such a great flavor to these yogurt bowls! 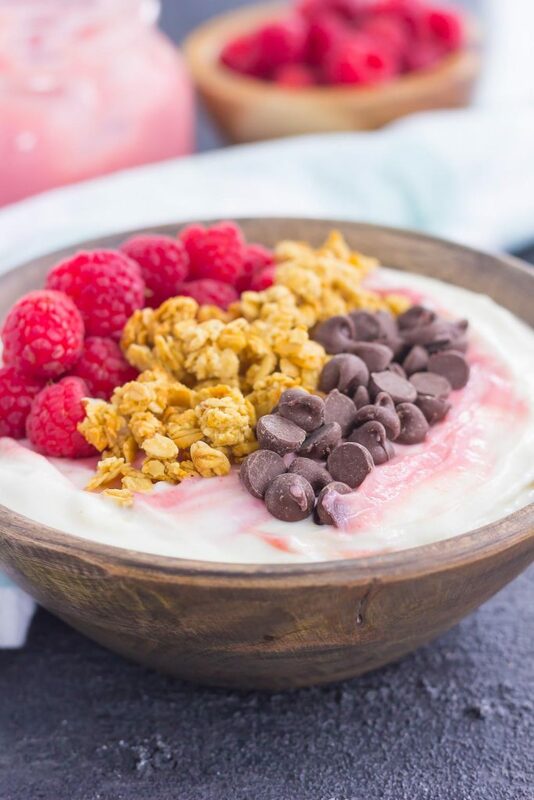 I can't even get over the gorgeous colors in this beautiful yogurt bowl, Gayle! I've got to find that raspberry grapefruit curd so I can try these! Thanks for the yogurt love, Sarah! I LOVE the flavor that the curd adds to this yogurt bowl! The perfect summer breakfast! It's the best! Thanks, Ashley. I love adding curd to yogurt -- it's so amazing! And a big yes to yogurt bowls. 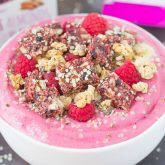 This one is so pretty with that pink curd and raspberries, and I'm in love with that rustic bowl. I could eat this every day! Thanks, Marcie! I'm loving the pink color, too! A breakfast of champions! I love it, Gayle! So colorful and tasty! 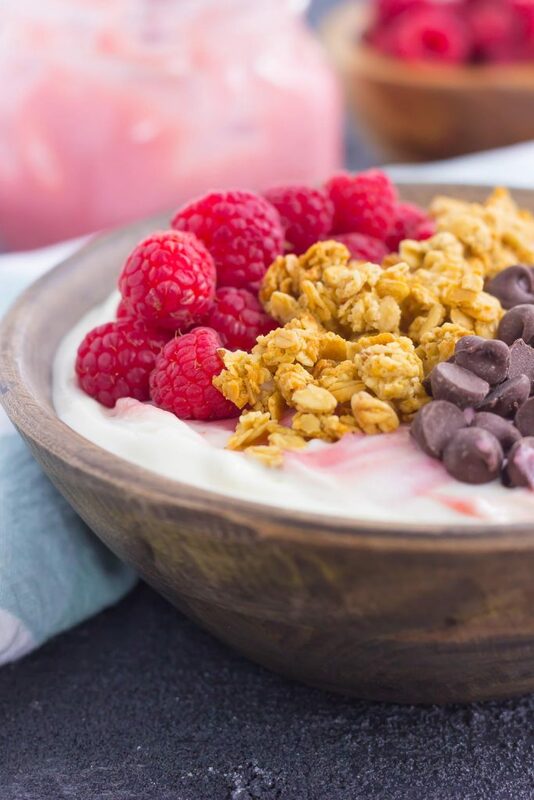 Everything we want in a yogurt bowl! Pinned! This is such a beautiful bowl, Gayle! I wish I had this for breakfast! Love that you added grapefruit curd! Thanks for the yogurt love and pin, Mira! I am loving that gorgeous swirl from the curd!! And with those berries and the granola ... my kind of breakfast!